AS SEEN ON THE SEASON PREMIERE OF "PENN & TELLER: FOOL US" ON THE THE CW NETWORK! "Michael Kent may be Columbus's most talented...there's no one else in his league." "The best we've ever had. I'm proud that you're from Columbus"
"Michael Kent nimbly shifts from comedic to amazing." 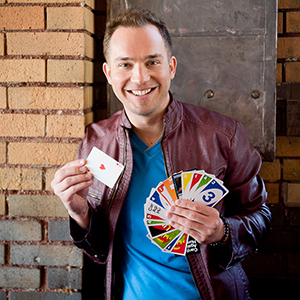 "Michael Kent performed at our sales meeting a very entertaining show that combined both humor and magic. The show was interactive with participation from the audience and the grand finale was impressive. Our sales team truly enjoyed the evening!" 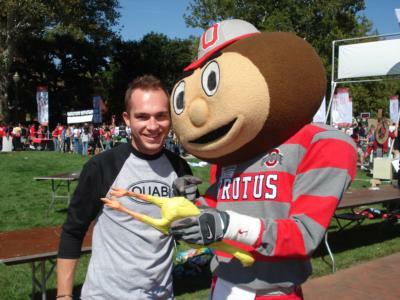 Michael Kent is a Comedian and Magician from Columbus, OH. Performing for colleges and corporate clients across America, Michael offers an impressive ability to connect with every audience he encounters. Michael has been entertaining large crowds since he was a young boy. He learned magic as a child by studying the highly-guarded books on the art. Mixed with an incomparable style of humor, he has found a formula for maximum entertainment. Michael is a contributing author of the book, "How to Achieve Unlimited Success: Strategies for Creating Extraordinary Results," where he writes about his experiences using magic and a positive attitude to pursue his dreams. Many of Michael's clients have referred to his professionalism when asked why they hire him year after year. His philosophy on entertainment is to put your guests at ease by entertaining them in a way that is friendly, conversational, and absolutely spellbinding. Disney, AT&T, Ernst & Young, Citizen Watch Company, Bulova International, Wendy's International, Inc, International Truck and Engine Corporate, Honda, The United Way, The American Cancer Society, Time Warner, US Army, US Navy Blue Angels, and hundreds more. 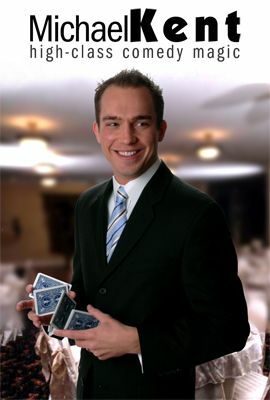 Michael is one of the busiest touring magicians on America's college circuit, performing in 80-100 colleges every year, including The Ohio State University, Purdue University, The University of Illinois, Kentucky Wesleyan College, The University of Dayton, Indiana University, Northern Kentucky University, Central Michigan University, The University of Vermont, Manchester College, York College, Walsh University, Muskingum College, Saint Anselm College, Alma College, Capital University, Columbus College of Art and Design, Ohio Dominican University, Hope College, Aquinas College, Ohio Northern University, Simmons College, Dennison University, Urbana University, Clarion University, Bentley College, Daniel Webster College, Heidelberg College, Penn State University - Abington, Shepherd University, Valparaiso University, Illinois College, Seton Hill University, Husson College, Northeastern University, Rutgers University - Camden, Bradley University, Grand Valley State University, Neumann College, Wilmington College and MANY MORE! Michael Kent's magic & comedy show was awesome! It drew one of the largest crowds we have ever had for an event! Everybody loved it and was talking about it for weeks!!!! Michael Kent displayed great professionalism, arriving early and using language appropriate to the crowd. He wowed the crowd with his humorous sketches, impressive magic, and relaxed demeanor. Michael's energy and bright personality made for an amazing show and we look to bring him back to campus next year. Michael Kent provided a very high class show with very amazing talent. His magic and comedy entertained all at a very high level that was more than exceptional. The interaction with the audience made all feel like part of the show. We had numerous compliments of Michael's show and the scheduling of such an event. We highly recommend his show to anyone. Thank you Michael Kent and GIGMasters. Michael was great! He went around pre show will were socializing and preformed for people individually. NICE TOUCH! Good clean fun that would appeal to a diverse age group. It was a pleasure to work with Michael. He was very personable and flexibile in the planning process, yet very professional. He performed strolling magic tricks for our Holiday Party. He is very talented and entertaining; leaving our group wanting more. I highly recommend Michael and his magic! Michael Kent was very nice and stayed around longer than he had to and helped with our door prizes. His personality along with his performance was outstanding. Working with Michael was a joy. From the minute I booked him to the day of the show he was very accomdating. He worked our campaign theme inot his act and involved our volunteers. He was awesome!! Michael Kent of High-Class Comedy Magic is EXCELLENT ! He is professional, easy to work with, and EXTREMELY talented. He responds quickly to email messages and is always willing to help with areas of party planning if he can. The guests at our school retirement party were amazed by his tricks and continue to talk about his show. I HIGHLY recommend him for any event you are planning. I plan on contacting Michael again for future parties and to speak at our school. Thank you, Michael, for a job well done!! Please note Michael Kent - High-Class Comedy Magic will also travel to Westerville, Blacklick, New Albany, Worthington, Lewis Center, Reynoldsburg, Galena, Dublin, Powell, Groveport, Hilliard, Pickerington, Johnstown, Pataskala, Amlin, Grove City, Canal Winchester, Sunbury, Unionville Center, Alexandria, Galloway, Lockbourne, Croton, Marysville, Baltimore, Delaware, Plain City, Centerburg, Carroll, Broadway.